Honey bees are the beneficial insects of all time. They are responsible for feeding the 7.13 billion people that inhabit planet earth. That's a pretty good reason to protect them were possible. Sometimes they become a problem to home owners when the take up residence in places that they should not be, such as soffits, wall voids, and landscape. 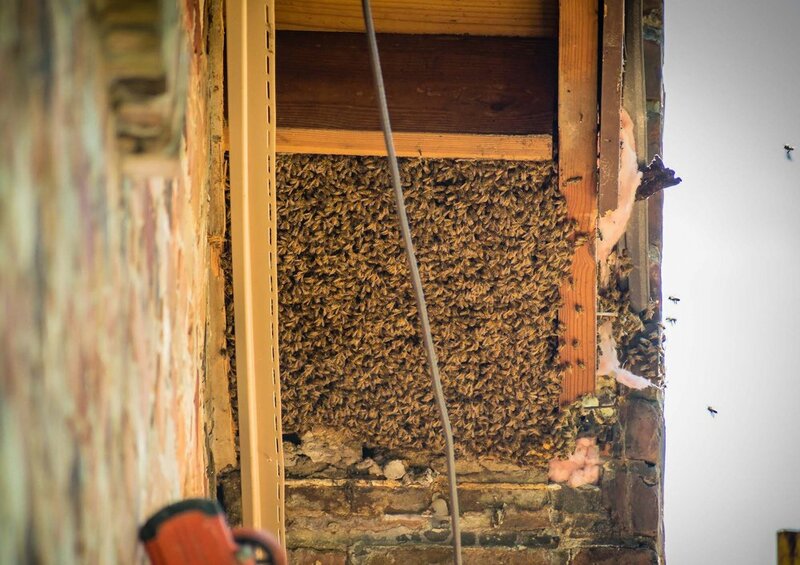 The most serious problems result when a swarm of honey bees locates a small opening or openings in the exterior wall, down a chimney, or behind some faulty flashing of a home & then nest in a wall void or some other interior area. If honey bees become well established within the wall voids of a house, large amounts of wax & honey may collect within the walls. As long as the bees are active, the workers keep the air moving inside the nest by fanning with their wings, so the temperature remains below the melting point of the wax. If the bees are killed, this form of air-conditioning ceases to function. In warm weather or if the interior of the house is kept warm, the wax within the wall void may then become soft enough to melt, allowing the honey to seep out of the storage cells & create a mess. If a sufficient amount of honey is inside the walls, enough may be absorbed by the plaster or similar porous wall material that an unsightly and virtually permanent stain may appear on the inside wall. Another problem inherent to such situations is that the presence of honey in the wall void will attract foraging worker bees from other honey bee colonies. Other insects, such as various flies, ants, and beetles, will also be attracted to the nest site and later infest other materials inside the home. Thus, there may be a continuous supply of bees or other pests around the house, even though the original colony was destroyed. Honey bees may be various shades of yellow, black, brown, or orange, with the head, antennae, legs, & a portion of the abdomen being dark. The body is covered with light colored hairs, thickest on top of the thorax. They usually present themselves during the Spring when they are making new colonies. You may see a ball of bees hanging off a branch in the yard. This is a new queen bee and a bunch of worker bees that are ready to start a colony. This "bee ball" is usually not aggressive and can be removed by a qualified bee keeper. IT IS IMPORTANT TO COMPLETELY REMOVE THE NEST AS SOON AS POSSIBLE AFTER THE COLONY IS CONTROLLED. DIAL ONE Franklynn Pest Control.